I first came to know anniebikes through comments she made on other blogs I read. She is one of few bloggers I know who not only takes time to write her own content, but regularly reads and thoughtfully comments on others’ posts. 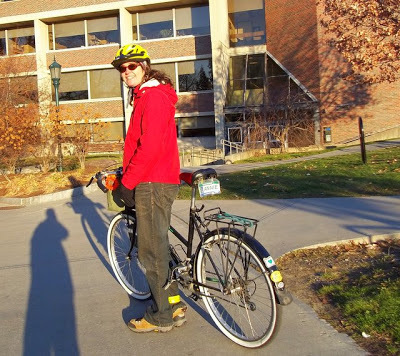 Annie writes frankly about day rides near her home in Vermont and the self-supported touring she does in a variety of places. 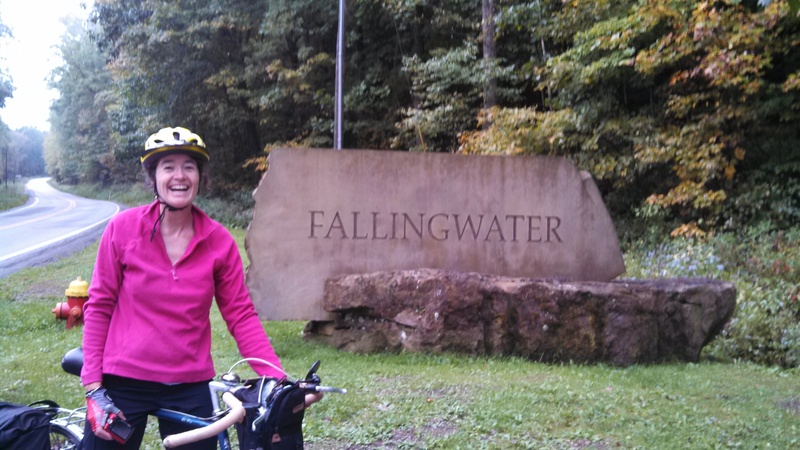 (This past year Annie rode the Great Allegheny Passage and C&O Canal.) Annie also explores other bike-related topics, like this recent favorite of mine, Fat Bikes in the Olympics? For Annie, the bicycle is part of everyday life. 1. Would you tell us a little about the area where you write and ride? anniebikes is in Burlington Vermont, located on the shores of Lake Champlain, bordering upstate New York to the west. The geography lends itself to an incredible ride network. By using ferries, including a summertime bike ferry across an ex-rail corridor, there are a myriad of possible options to link islands, New York, Vermont, and Canada. 2. What is one sentence that summarizes anniebikes? I am a veteran commuter and bike tourist that dabbles in style and as much as possible aims to work on my own bicycles. 3. What prompted you to start anniebikes and why did you choose to write about bicycling? I needed a creative outlet, I like to write. My husband is also an avid rider though he doesn’t live and breathe the life like I do. Blogging was the best platform to connect with other like-minded individuals. Oh, that’s an easy one. Guess what my first name is? 5. Who are you writing for? Do you have a particular audience in mind? I am writing for myself. It’s therapeutic and sharpens my writing skills. 6. You seem to be a touring cyclist at heart. What is it about bike touring that compels you to write? I pen journals while I’m on a tour. It started on a cross-country bike ride, 30 years ago. I wanted to remember how it felt to ride when I’m old and bound to a recliner. I continue writing now for mostly our children’s benefit (I’m currently transcribing, editing world tour journals). Some day they’ll appreciate the effort and hopefully learn a little more about mom and dad. 7. What other aspects of bicycling do you enjoy writing about? While I don’t always love working on bikes, I do it to save money. I chronicle these “adventures” to show others that as home mechanics we all make mistakes, but the process can nonetheless be satisfying. 8. What role do your photos have in the posts you write? I’ve become a better photographer since starting the blog, but photos aren’t crucial to inspiring my writing. Of course there are the exceptions: you see an interesting sculpture, flower, sunset, etc. Mostly, I have a thought, a subject, that I ponder and it hopefully turns into a post. Sometimes I scramble to come up with photos that are appropriate. 9. What are your favorite parts of being a blogger? I like coming up with a variety of posts. I think this will help keep the blog fresh, inviting, and hopefully I won’t become bored as a writer. 10. Was there anything about maintaining a blog that surprised you? I thought I might struggle with coming up with enough bike-related topics to write about, but here it is 650 posts later and I’m still going strong. Also, blogging is very time-consuming, at least for me. Writing does not come naturally. I write and re-write. 11. Do you have any favorite posts? My personal favorites tend to be humorous, most because I’m pleased I can do it once in a blue moon. Sometimes the writing just clicks. 12. What tips do you have for someone who wants to start a blog? Think about what you are passionate about and blog about it. This will maintain your focus and hopefully keep you writing for a long time. Good photography can help but is not critical. At the very least, add one photo per post. I gravitate towards sites that have good information and resist the temptation to brood or spill too much personal information. I also dislike profanity. 13. What did I forget to ask you that I should have? With a family, it’s sometimes a balancing act. I blog on days off when the kids are in school or I stay up late or get up early to fit in a half hour or so. I try to keep blogging in perspective. It’s time for the creative “me”, which should alternate with time to do errands, help kids with homework, and run the vacuum every six months! I love the answer to “how do I fit in time to write”. It sounds pretty familiar but said better than I could say. Thanks, MG, for this series and for featuring my blog in this week’s Writing & Riding round up. May the wind be at your back. My pleasure! You have a such a good blog and I always look forward to reading it! Great to see Annie here, thanks!